No matter what they say, it’s coffee (or possibly tea, Earl Grey, hot), not dilithium, that makes Starfleet go ’round. So of course your Trek Sims – and your Trekker Sims – need some coffee mugs to clutter up their desks! There are two sets of recolours: one plain and unadorned, and one with various Starfleet insignia. (The Starfleet mugs have the insignia on both sides of the mug, so that left-handed people like me and Bruce Greenwood can show them off as well. Also, the black isn’t quite as light-suckingly black in game as it looks like in the screenshots.) You also get six different kinds of beverages. Department insignia by Star Trek Minutiae. The folder in the zip file below has two subfolders. The “Plain Mugs” folder contains the plain recols, the beverages, and most importantly, the mesh. The “Starfleet Mugs” folder contains the Starfleet insignia recols. 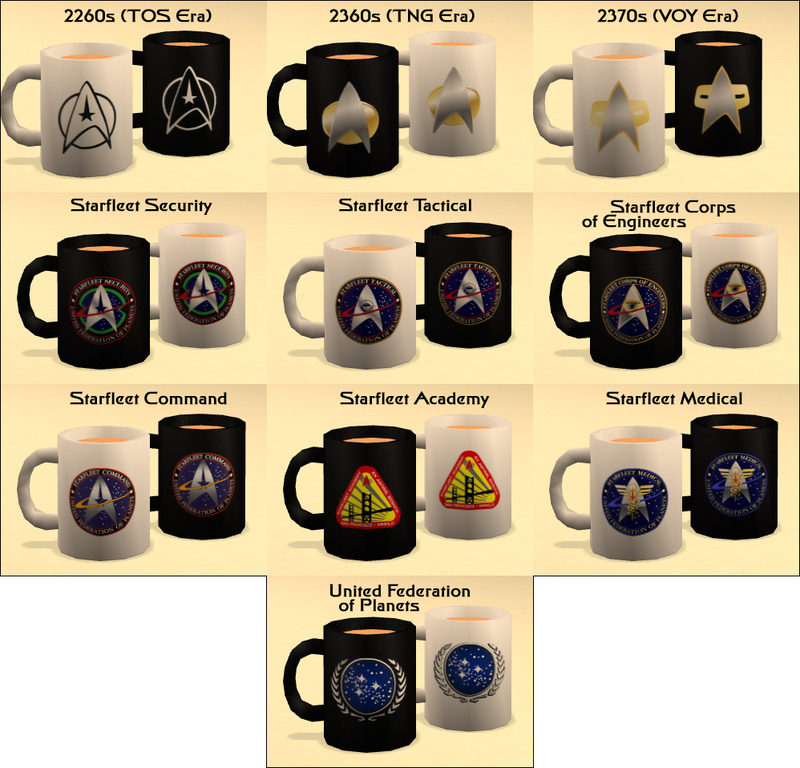 If you only want the plain mugs but not the Starfleet ones, you can safely delete the “Starfleet Mugs” folder – but if you only want the Starfleet mugs but not the plain ones, make sure you don’t delete the file called obj_nixnivis_coffeemug_MESH.package from the Plain folder (this would be the plain, white mug in game). As the name implies, this is the mesh, so none of the recolours will show up without it. This entry was posted on 18 June, 2011 at 10:14	and is filed under BUY MODE, Decorative, DOWNLOADS, Objects, Star Trek, THEMES. You can follow any responses to this entry through the RSS 2.0 feed. You can leave a response, or trackback from your own site. This is a very nice job indeed. Fancy meeting you here. 😉 And thanks! Yeah, it always bugged me that Maxis couldn’t bother to put liquid in their coffee cups. If they’d wanted to, they could even have added liquid AND make it go away when the Sim had finished drinking by adding a BHAV to the drinking interaction, but of course they didn’t. BTW, I used the DXT3 format on the insignia mugs, DXT1 wouldn’t have done the details very well. I think I used DXT3 on the plain mugs as well, but that’s just because I was too lazy to change the format. 😉 DXT1 would have worked there.